The freedom of brotherly music | Grigoryan Brothers | Dispeker Artists, Inc. THE extended Grigoryan family is living up to its reputation as a hereditary caste of musicians. Brothers Slava and Leonard are the latest stars in a line that could, at a pinch, field a chamber orchestra comprising uncles and aunts alone. 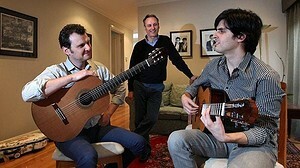 Even Slava's six-year-old son, Paolo, has inherited the bantam-sized steel-string guitar Slava's father Edward gave him when he was six. The beat goes on.